Are Guinea Pigs Right For Your Home? Remember that your PayPal donation to the Critter Connection is tax deductible. iGive for all your online shopping. The Critter Connection, Inc., is a non-profit group dedicated to the rescue and rehabilitation of abandoned and neglected guinea pigs. 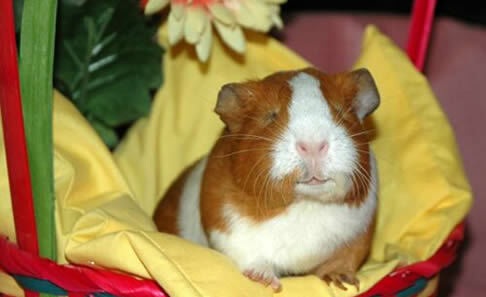 Located in Durham, Connecticut, the rescue was started in early 2004 when its founder, Cindy Kuester, realized that abandoned guinea pigs in our state had nowhere to go. Since then, the rescue has placed more than 1,800 abandoned guinea pigs into new homes! Please take time to browse our Web site, learn our story, read our care information, and check out our adoption postings. If you’re interested in helping out, but are unable to adopt a pet at this time, we also welcome donations of money, food, and supplies — check out the “How You Can Help” links. June 16, 2018 — If you are making an inquiry about adoption, surrender, abandonment or seizure cases, or fostering, please see the June 2018 item on our Rescue News page. ©2005-2016 The Critter Connection, Inc.